Poem: And What of Paris? –	brilliance fading to black. –	breaking down all logic. –	rules shattering like glass. –	canvas tattered in the wind. –	these pages red with blood. –	remember we are born of mud. then your god isn’t very good. 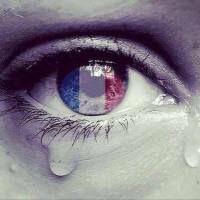 Pleased to see a non pious, ridiculous, pompous, pointless ‘My prayers go to those in Paris ‘ post. Maybe an omnipotent god would have stopped it happening. Oh sorry. It all happens for His purpose. Then he’s a fucker I don’t want to believe in. If both sides have an omnipotent god then how would it end? Only impotent gods do battle via madmen. I rest my case. I’m having a hard time on FB just now, people objecting to my stance.